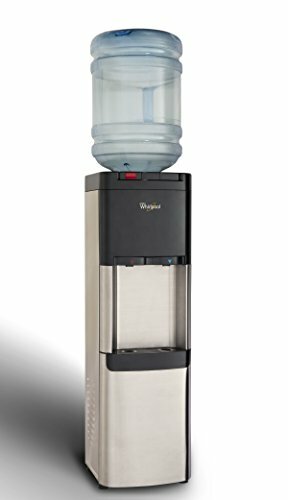 This Whirlpool® self cleaning stainless steel water cooler has an automatic self cleaning system that's injects unstable oxygen into the water cooler. This charged oxygen destroys bacteria on contact, preventing the bacteria biofilm buildup that occurs in regular coolers. This keeps your water tasting fresh and sanitary over years of use. In normal water coolers, bacteria levels are often hundreds or even thousands of times higher than government recommended safety limits as they are seldom cleaned. This beautifully designed product will give you a faster pour, colder water, hotter water, and all in an attractive cabinet. With water that is as cold as 3-degree Celsius, you can enjoy the fresh taste of a nice glass of icy-cold water. Instantly-hot water temps will allow you the convenience of hot tea and soups, immediately! "Piano-key" push-buttons are designed to prevent tipping and remain high enough to keep toddlers from accessing them. CAUTION: The self-cleaning system does not purify or filter water, you must always use quality water. Bacteria buildup is prevented by using reactive oxygen to clean the insides of the cooler. It automatically cleans six times a day. Avoids the muddy taste that develops over time in normal coolers from not being cleaned. Chillingly cold water is cooled by a large piece of ice, maintaining temperatures that are around 9°F colder than most other cooler. The hot water is kept steaming hot at all times to make delicious tea. High grade stainless steel front features curved edges to highlight the stainless steel from many visual angles. Outlasts other brands as the compressor turns on less frequently because of the proprietary cooling system technology. Robust commercial design has unbreakable water faucets, a solid steel frame that can take over 300 lbs of top weight, and cold rolled steel sides.